finally a yaeger baby pin mount lockable in place! unlike other baby pin tube mounts, this one will not spin in place. a few twists of the T handle expands the width of the base to tighten inside the risers. 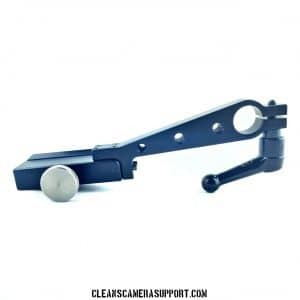 now you can push your cart without the fear of your monitor bouncing off! furthermore, this yaeger baby pin mount you can push over the roughest of terrains confident your gear will be safe. please note, our yaeger pin, while inspired by cardellini’s anderton pin, does not share the same dimensions or purpose. the anderton pin fits in 1” diameter holes but does not fit in the risers for the yaeger cart. our yaeger cart pin solves this problem & does fit in the riser of the cart. the baby pin is 3″ high & the expandable base is 3″ for a total length of 6″. the pin weighs about 3lbs. this yaeger baby pin mount only works with a maken material handling case carts’ risers! the base of the mount is too skinny to be able to tighen on a yaeger cart top shelf. likewise, this mount does not work with the backstage cart.